I never ever EVER thought I’d be asking myself–let alone a complete stranger–a question like this, but…what do you do when you’re not quite sure The One is The One, anymore? I’m crazy about my boyfriend, but there’s this other guy…he’s really nice and funny and I feel like I can be myself around him in a way I can’t always be with my boyfriend. The only problem is, he’s dead. Not dead dead–he looks as living as the next person and way more living than any zombie I’ve ever seen–but he’s not. He’s Unsettled and could go back to his grave any minute. And the only OTHER problem is that I love my boyfriend and don’t understand why I’m having more-than-friendly feelings for someone else! And the only other OTHER problem is that I’m super busy dealing with black magic and the flesh-hungry variety of zombies and really don’t have time for all this love-related stress. Your problems are out of the ordinary, too. Scary even! Can we trade? Seriously, I could handle the black magic part. Dabbling in online ouija and the occasional voodoo-type revenge scenario comes naturally to me. But I draw the line at combating flesh hungry zombies. They always go for someone like me—the girl with a little meat on her bones. Seriously, seriously, love is great and all. Still, I believe you’ll be happier with someone you can act yourself around. Did you know that a person can die from suppressing their true nature? Not really. But you may develop several unattractive nervous mannerisms in the process. I’d take my chances with the half-dead guy. Letter provided by Stacey Jay, the talented author of the hilarious UNDEAD MUCH? 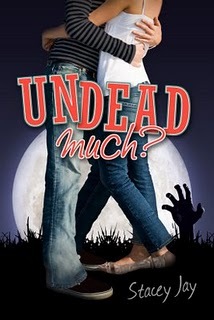 the second in her trIlogy that started with YOU ARE SO UNDEAD TO ME and ended with MY SO-CALLED DEATH. It has romance, it has gore, it has everything you could want in a YA horror/romance spoof. Check out her cool cover below! Lots of my friends have parents who are divorced, which is awful, but I seem to have the opposite problem. My parents act like they’re in a perpetual state of puppy love and they have no concept of modesty when it comes to PDAs. They’ll kiss at the grocery store or nuzzle each other at the movies. My dad even groped my mom right at the dinner table. Can you believe that? Needless to say, I lost my appetite. Frankly, I’m surprised I didn’t yak all over the table. Now I’m not saying that parental PDAs are nearly as bad as your parents getting divorced, but it’s totally embarrassing nonetheless. And gross. So how should I deal with it? Sure parental-PDAs are nowhere near a divorce-level catastrophe, but I don’t discriminate against little problems. Besides, almost losing your dinner all over the table constitutes a semi-emergency. You could take a picture while they’re kissing. And threaten to post it on your blog. Sadly, they might actually like that. Have you considered a spray bottle full of water? I’ve used one to train my cat not to jump up on the kitchen counter while I cook. A shock collar might be a little extreme, though. Unfortunately, we can’t choose our parents. Shakespeare said, Being born is like being kidnapped. And then sold into slavery. I hope you turn eighteen soon! Letter courtesy of Kristin Walker, author of the hilarious and heartfelt YA novel, A MATCH MADE IN HIGH SCHOOL. I love, love, love this book!